Five scrapbooks provided by the Heritage Research Center at High Point Public Library are now up on DigitalNC. These scrapbooks collect newspaper clippings that focus on municipal issues in and around High Point, Greensboro, and Winston-Salem, North Carolina. Each scrapbook covers topics in chronological order, with the first volume starting with articles from early 1951, and the last volume ending with articles from 1954. Many newspapers are represented in these scrapbooks including The High Point Enterprise, Greensboro Daily News, and The Beacon. 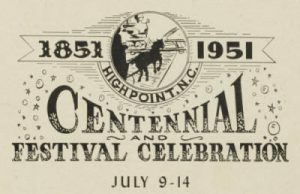 Also collected in volume 29, is a program from High Point’s 1951 centennial celebration, which focused on a “Dramatic Historical Spectacle” called “Then & Now” that told the history of High Point. 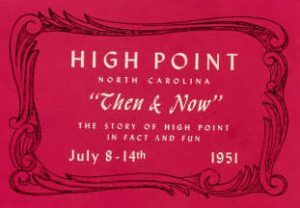 The program also contains many advertisements for High Point businesses, including many furniture companies for which High Point continues to be known today. Click here to take a look at these 5 scrapbooks, and learn more about the Heritage Research Center at High Point Public Library by visiting their partner page and website.